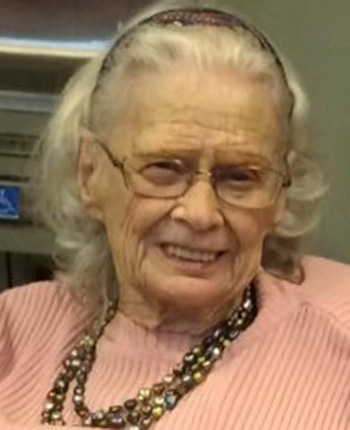 WESTFIELD — Pauline D. (Dascomb) Winslow, 93, of Beckman Avenue Westfield, passed away, Wednesday morning, Aug. 29, 2018, at home following an extended illness. Pauline was born Nov. 16, 1924, in Westfield, N.Y., a daughter of the late Clair Everett and Cordelia Harriet Grace (Saunders) Dascomb. A Westfield resident most all her life, Pauline was a 1942 Graduate of Westfield Academy and had been employed at the former WT Grant Store and various other Westfield Main Street businesses. She retired from the offices of Renold Inc. after more than 20 years of service. Pauline is survived by her children: Mark (Tina) Winslow, Roxanne (George Bausum) Baideme and Ellen Hardy, all of Westfield; 13 grandchildren; many great-grandchildren; and two great-great-grandchildren also survive. Pauline is further survived by Arthur (Tatsu) Bell of Texas, who was like a son to her. She was preceded in death by her husband, Everett H. Winslow; and by her sister, Edna Bajdo. Friends may call on Friday evening, Aug. 31, 2018, from 6-8 p.m., at the MASON Funeral Home, 37 Clinton St., Westfield, and are invited to attend her funeral services there on Saturday, Sept. 1, 2018, at noon with the Rev. Charles Robertson officiating. Burial will be in Volusia Cemetery. Memorials may be made to Volusia Cemetery, 8451 Pigeon Road, Ripley, NY 14775. Pauline’s family wishes to thank the caregivers and neighbors for their valuable assistance in allowing Pauline to remain in her childhood home. Log on to www. masonfuneral.com to send the Winslow family a message of sympathy, to light a memorial candle or for further information.